Bugz! Creepy, crawly and oh so fun to pop! The aim of the game is to pop as many bugz as possible by starting a chain reaction of bugz popping. To do this you have to tap the screen to create an initial pop which will expand and then shrink again. If your pop hits another bug then that bug will pop, starting a chain reaction effect. • 102 levels of addictive gameplay! • Multiple profile management with ability to save and load your current state. • Online high score table - upload your score and view worldwide high scores in-game. • Prefer to listen to your iPod while playing? Simply toggle the setting in the Settings app. • Hours of replay value. • Updates are free, forever. 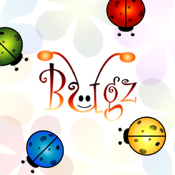 There are more screenshots and videos available on the Bugz website. To change options for Bugz, simply open the Settings app on your device and scroll down. The settings for Bugz will be below the built-in device settings.